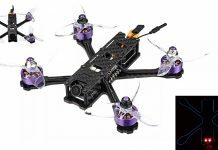 HGLRC announced their new Mefisto 5″ FPV Drone with two type of brushless motors. 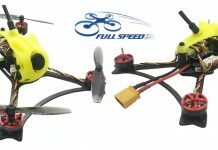 While the HF2306 2450KV edition is optimized for 4-5s batteries, the FLAME 2207 1775KV one is suitable for 5-6S LIPOs. Both versions are compatible with 5 inch propellers. This dual type motor option is also adopted by the HobbyMate Comet racing quad. In front of the aircraft is located a RunCam Swift 2 600TVL camera with 1/3″ SONY Super HAD II CCD FPV camera and 2.1mm lens. The FPV camera is paired with a 48CH/5.8G video transmitter. The GTX226 V2’s TX power can be toggled between 25, 100, 200 and 400mW. According to your existing remote controller, you can opt to purchase the HGLRC Mefisto in bundle with Frsky XM+ or FlySky A8S radio receiver. Gemfan 5152 5″ 3-leaf propeller. Optional Frsky XM+ or FlySky A8S radio receiver.